The citizen of every nation is very important to that nation. There are certain rights and privileges that are only available to citizens of a country. Thus, every nation has a way of determining who is/isn’t a citizen and steps for acquiring citizenship. For example, in Nigeria major offices like the President, Governors, The National Assembly and State House of Assembly cannot be occupied by a person who has voluntarily acquired the citizenship of another country. However, this is subject to the provision of S. 28 of the 1999 Constitution. For those born in Nigeria before the date of independence, either of their parent or grandparents must belong/belonged to an indigenous Nigerian community. What is meant by indigenous community is that such person’s parent/grandparent belonged to a native tribe like Hausa, Yoruba, Igbo, Ibibio, Efik and so on. For those born after the date of Nigerian Independence, either of their parents or grandparents are/were citizens of Nigeria. For those born outside Nigeria, either of his parents is a citizen of Nigeria. According to the provision of S. 25 (2) of the 1999 Constitution, the Nigerian date of Independence is 1st October 1960. He has subscribed to the oath of allegiance as provided for in the seventh schedule to the Constitution. Any woman who is or has been married to a Nigerian citizen. Any person of full age and capacity born outside Nigeria and has any of his grandparents as a Nigerian citizen. He has demonstrated a clear intention to be domiciled in Nigeria. He is, in the opinion of the governor in the state where he intends to reside, acceptable to the local community and has assimilated into the way of life of such community. He is a person who has made or is capable of contributing to the progress, wellbeing and development of Nigeria. He has subscribed to the oath of allegiance as contained in the seventh schedule of the constitution. He has lived in Nigeria for a period not less than 15 years immediately preceding the date of his application to be naturalised or he has resided in Nigeria continuously for a period of 12 months preceding the application and has in the past 20 years preceding the 12 months resided for an aggregate period that is not less than 15 years. It should be noted that according to the provision of S. 307 of the 1999 Constitution, a citizen by naturalisation or registration cannot hold an elective or appointive post till a period of ten years have elapsed after acquiring his citizenship. 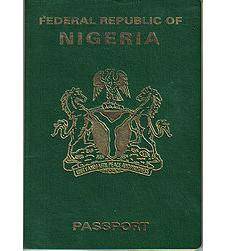 A person who is a citizen of Nigeria by birth can be a citizen of another country in conjunction with his Nigerian citizenship. However, a person who is a citizen by naturalisation or registration cannot acquire another citizenship except if that other citizenship is one by birth. It should be noted that Nigerian citizenship by naturalisation or registration would not take effect until the applicant renounces his citizenship of any other country within 12 months after registration or grant of a certificate of naturalisation. However, this would not apply if the citizenship of the other country is one that is gotten by birth. A Nigerian who is of full age can renounce his/her citizenship by applying to the president for such. The President would register the application, upon which the applicant ceases to be a Nigerian citizen. However the President can reject such application if it is made during a war in which Nigeria is physically involved or it is contrary to public policy. For the purpose of renunciation of Nigerian citizenship, S. 29 (4) of the Constitution provides that anyone who is at or above 18 years or is a married woman is qualified to renounce his/her citizenship. The Nigerian President can deprive a naturalised citizen of his Nigerian citizenship if such person bags an imprisonment of three years or more within a period of seven years after he was naturalised. The President can also deprive a registered or naturalised citizen of Nigeria of his citizenship if he is considered to be disloyal to the Federal Republic of Nigeria. This consideration would be based on his acts or speech or after due enquiry by the President in a manner stated in the regulations. Please note that the act or speech must relate to what he did or said from the records of proceedings of a court of law or tribunal established by law. Also, the President may deprive a citizen by registration or naturalisation of his citizenship if he trades with the enemy of Nigeria during the period of war in which Nigeria is physically involved or conducts business that is against the interest of Nigeria. This applies to both registration and naturalisation. Note finally that the president has the power to make regulations that are not inconsistent with the provision of the Constitution regarding the citizenship and the status of anybody subject to the rules of citizenship. The law requires that whatever regulations made by the president in respect of citizenship shall be laid before the National Assembly. why is dis djetlawyer site is not always available? Wow. I am quite sorry for any inconvenience. What area of law are you concerned with? I luv dis site. Ok! EDUCATIVE AND AND VERY EASY TO COMPREHEND IN SIMPLE TERMS…KUDOS! Can a Nigerian citizen by birth effectively renounce his citizenship? Not really. There is no real need to renounce it. Because they aren’t citizens of Nigeria by birth. This means that they don’t have any cultural ties to Nigeria. So, having them renounce other citizenships helps to ensure their loyalty to an extent. If you were born in Nigeria to Nigerian citizens, then you are a citizen by birth. Citizens by birth can’t lose their Nigerian Citizenship. Hello. If you were born in Nigeria to Nigerian citizens, then you are a citizen by birth. A citizen by birth can’t lose his/her Nigerian citizenship. Hi, My mother was Nigerian, (she was Yoruba I think). So only my mother is natural born Nigerian. Can you explain the difference between e-passpoort and “official e-passpoort”. I am trying to get Nigerian passpoort. The last time I had Nigerian passpoort , I was a 6 yr old child, where do i start? PS: I forgot to mention, but of course thank you for answering my questions. Hi!What if only one parent is Nigerian citizen and the person is born in Nigeria? The person becomes a Nigeran citizen. Can the president deprive any citizen of Nigeria by birth or by registration his citizenship?